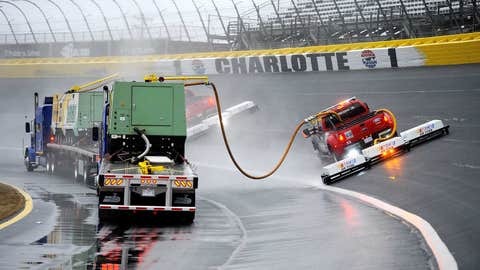 CHARLOTTE, NC - DEC. 09: The Air Titan is used to dry the track prior to testing at Charlotte Motor Speedway on Dec. 9, 2013 in Charlotte, N.C. Testing was eventually canceled for the day and has been postponed until Wed.
– The drivers liked the new cars, because with less weight and more downforce they drove better than the old Gen-5 racers they replaced. – Track operators liked them because they made headlines by breaking speed records so often. – Manufacturers liked them because the Chevrolet SS, Ford Fusion and Toyota Camry Sprint Cup cars look a lot more like their production counterparts than the G-5s ever did. – And, last but certainly not least, fans liked them because they could actually tell a Ford from a Toyota from a Chevrolet. But there was one critical area NASCAR wants to improve upon for 2014: Green-flag passes for the lead at the 1.5-mile tracks that make up roughly one-third the NASCAR Sprint Cup schedule. In the 11 races run this year at 1.5-mile tracks, four times the race-winning pass was made on pit road and three more times the race-winning move came either during a restart or in the first few laps after it. Only five times at 1.5-mile tracks did the driver who led the most laps go on to win the race. To NASCAR, that’s not good enough. So the majority of the NASCAR Sprint Cup teams are testing at Charlotte Motor Speedway this week with an eye towards making rule changes for 2014 that will increase passing at the front of the field. "The No. 1 thing we had to judge in the Gen-6 car was acceptance by the manufacturers, the teams and the drivers. That’s the No. 1 thing," said NASCAR Chairman and CEO Brian France. "And then obviously we want to get more lead changes and we want to get closer, tighter competition. … The point is that we’re going to be working all the time on getting the competition — and it should have — lead changes are going to be a huge part. I think that is a big measuring stick." The test was scheduled for Monday, although intermittent rain at CMS today and forecast for Tuesday caused it to be pushed back until Wednesday. This @NASCAR test @CLTMotorSpdwy needs some Goodyear rain tires!! One team not testing is the 2013 Sprint Cup championship squad led by driver Jimmie Johnson and crew chief Chad Knaus. While the other three Hendrick Motorsports cars will be testing, Knaus will use the event as a rare opportunity to get a fresh look at the proceedings. "I’m going to spend a little bit of time in the garage, and then I’m actually going to go up into one of the suites and watch some of the races that they’ll be having and trying to get a feel for what it is that maybe NASCAR is really trying to do and see if I can maybe offer a little bit of a different perspective," said Knaus. "I’ve never actually seen these cars go around the race track from the stands, so it’s going to be unique for me just to get up there and see what it looks like." For the teams, there is an added benefit to the test, especially for new driver-crew-chief-team pairings: Being on track allows the race personnel to build chemistry and the critical communication between driver and crew chief. "I’ve never been more excited to test a race car in my whole life, to tell you the truth," said Kevin Harvick, who will get his first seat team in his 2014 ride, the No. 4 Stewart-Haas Racing Chevrolet with new crew chief Rodney Childers. "The enthusiasm that you can feel from the guys … that enthusiasm is undeniable. And you want to take that enthusiasm and make good use of it." Even for drivers not changing teams or crew chiefs there is incentive to test. "I’m looking at this as an opportunity to get on a level playing field," said Greg Biffle, who finished a disappointing ninth in the final Sprint Cup points standings. "It’s been well documented that as an organization, Roush Fenway, we were probably a little bit behind this year. We didn’t get our fair share of tops 10s and fives and wins that we should have — certainly not like 2012. "So I’m hoping this rule change package gives us another reset, so to speak, gives us a chance to get back, try new things and maybe we get to the punch a little quicker than the competition does." Knaus, the championship crew chief also welcomes the test, but for a different reason. "For me personally, I like the changes," Knaus said. "Because of Jimmie’s ability to adapt, the way the team can adapt and move on quickly and our resources. I think when NASCAR makes a rule change that falls right into our wheelhouse."